David M. Rubenstein, Chairman of the John F. Kennedy Center for the Performing Arts, today announced an expansion project to be constructed south of the existing facility. The project will include rehearsal space as well as dedicated classroom space and multipurpose rooms for the Center’s extensive arts education and arts management education programs. Public access spaces will include gardens, an outdoor video wall upon which simulcast performances and other multimedia events may be projected, and an outdoor performance space on the river. The expansion will be designed by Steven Holl and senior partner Chris McVoy of Steven Holl Architects. Mr. Holl’s initial concept for the project includes three connected pavilions that will house classrooms, rehearsal rooms, lecture space, multipurpose rooms, and limited office space. In the initial concept, one pavilion will float on the Potomac River and offer an outdoor stage. Public gardens will fill out the space, fusing the Kennedy Center with the landscape and river. The exteriors will utilize translucent Okalux, glass, and Carrara marble, the same Italian marble which clads the original facility. The silhouette of the current building will be preserved by connecting the new structure underground and via the main plaza. A formal design will be created and announced in the coming months. The project is expected to cost approximately $100 million. 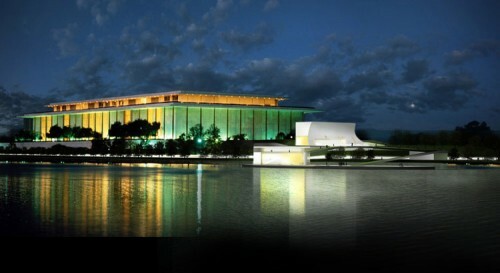 Kennedy Center Chairman David M. Rubenstein will donate $50 million toward the design and construction of the new building. This generous pledge is among the largest ever given to a federally-connected nonprofit organization. The design and construction costs for the expansion project will be paid for entirely with private funds. “I am pleased to pledge these funds as the lead gift to the Kennedy Center expansion project and encourage others to donate to this project,” stated Mr. Rubenstein. “As the federal budget tightens, I hope more Americans will consider including nonprofit federal entities in their own philanthropy as well.” Mr. Rubenstein’s other philanthropic endeavors include major gifts to the National Archives, the Washington Monument, and the Smithsonian Institution. With Mr. Rubenstein’s $50 million lead gift, the Center has begun a major fundraising campaign of $125 million: $50 million more for the expansion project and an additional $25 million for major programming initiatives in the years ahead. David M. Rubenstein is the most generous donor in Kennedy Center history, with gifts totaling more than $75 million. In addition to two $10 million pledges in 2010 and 2011 for programming, educational, and outreach activities, including the Rubenstein Arts Access Program which seeks to make the arts accessible to children, young adults, and to people who have little or limited ability to attend and enjoy the performing arts, Mr. Rubenstein has underwritten several Kennedy Center, Washington National Opera, and National Symphony Orchestra programs. Last year, the Kennedy Center installed and inaugurated the $2 million Rubenstein Family Organ in the Concert Hall. Previous underwriting includes 2011’s The Presidency of John F. Kennedy: A 50th Anniversary Celebration, the 2010 International VSA Festival in the 2009-10 season, ARABESQUE: Arts of the Arab World in the 2008-09 season, Leonard Slatkin’s farewell performance and select KC Jazz Club performances in the 2007-08 season, the six month-long, District-wide Shakespeare in Washington festival in the 2006-07 season, the NSO Pops season in 2005-06, and the Kennedy Center’s original production of Mister Roberts in the 2004-05 season. Last June, a bill that authorized the Kennedy Center to construct an expansion project at the south end of the Kennedy Center grounds was unanimously approved by both houses of Congress and subsequently signed into law by President Obama. The bill stated that the costs of planning, design, engineering, and construction of the expansion project would be paid for using private funds. The Kennedy Center board formed a ten-member architect selection committee that was co-chaired by David M. Rubenstein and Fred Eychaner and included Jean Kennedy Smith and Victoria Reggie Kennedy, among other board members. The selection committee unanimously recommended Mr. Holl to the full board.